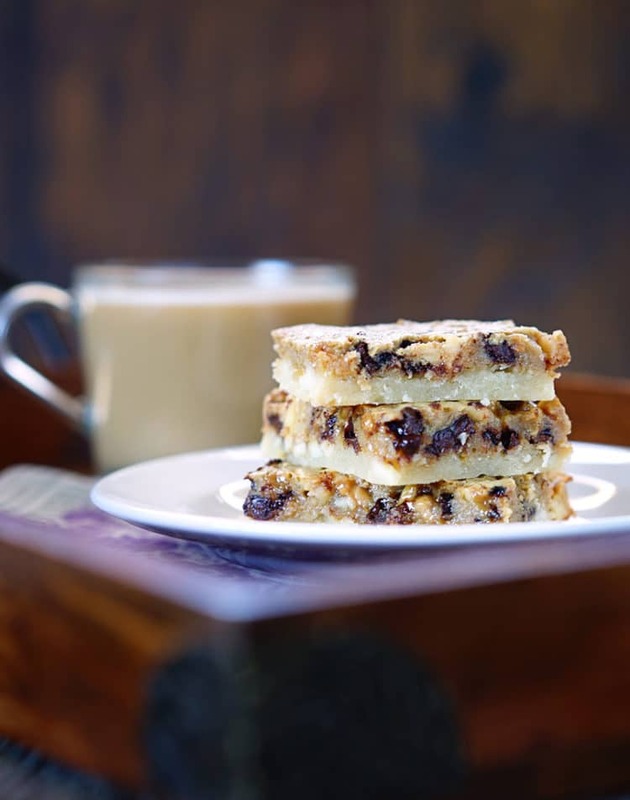 These Chocolate Caramel Butter Bars remind me of a shortbread cookie that was kissed by chocolate and slathered with caramel. The crumble topping is laced with slivered almonds and covers the decadent chocolate and caramel filling for a wonderful party dessert. That is if you feel like sharing. I decided on updating this post with a video. My first actually! I hope you enjoy. This is perfect for game day parties and it’s a crowd pleaser. 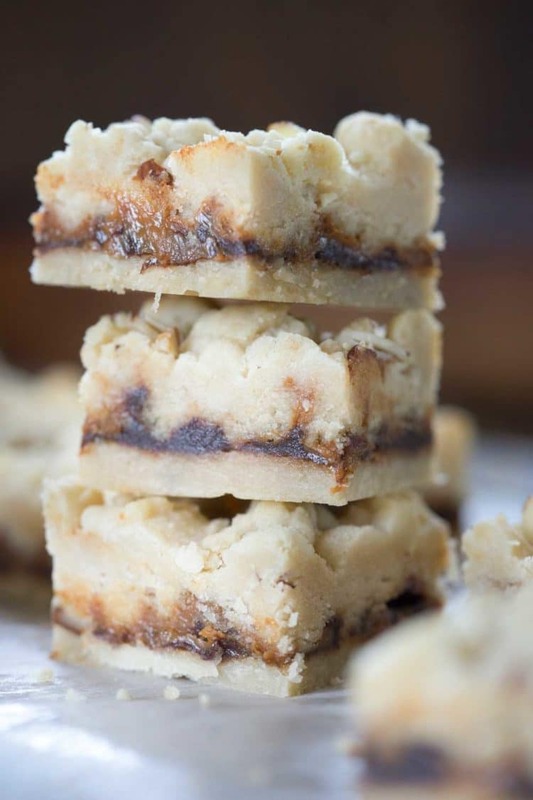 Know what I love about these Chocolate Caramel Butter Bars? They have a buttery, crunchy texture like a shortbread cookie on the outside and a soft, gooey center. I mean how can you resist? Even though it’s warm out, this is worth turning on that oven. I make these early in the day so the house doesn’t heat up. See that gooey center? 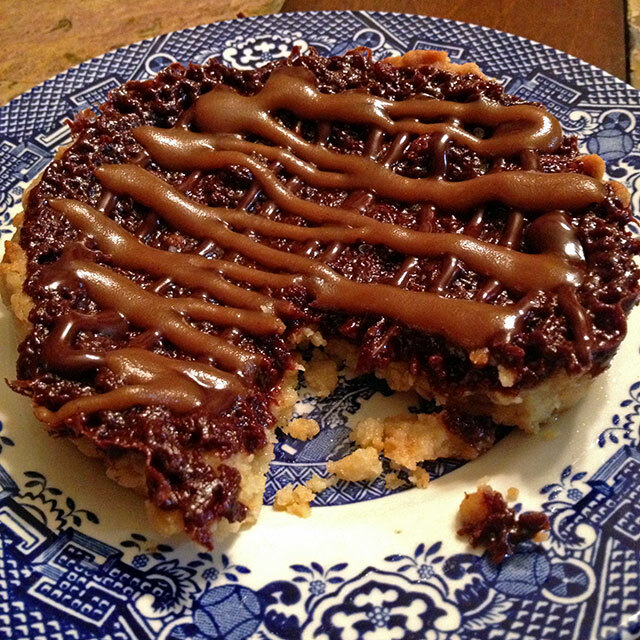 It’s made up of chocolate chips and caramel that are placed on top of the crust after a pre-bake. The other half of the buttery crumb dough goes on top and then finishes baking. 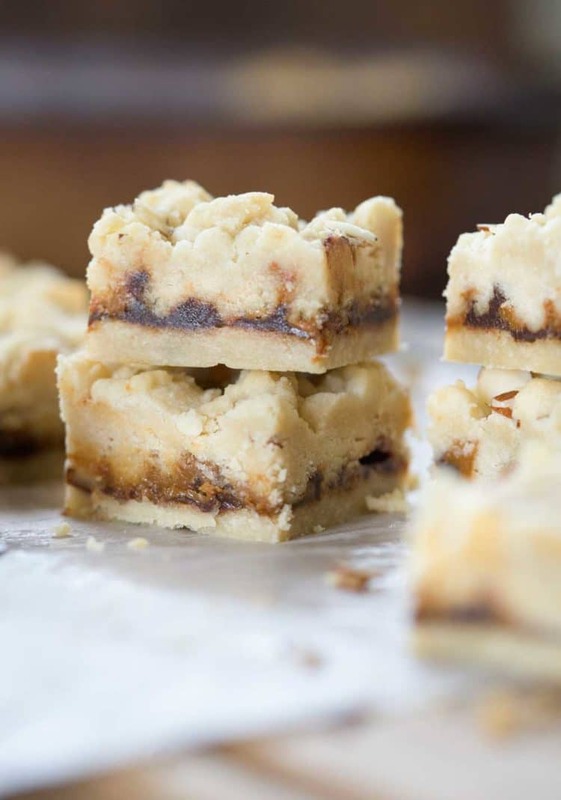 The result are these heavenly, rich and buttery bar cookies. 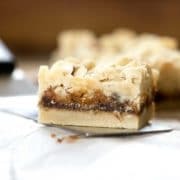 Worthy of bringing to a party, which is exactly what I did with these, because you’ll want to eat all of these Chocolate Caramel Butter Bars. Be kind and share! Bar cookies are probably my favorite. 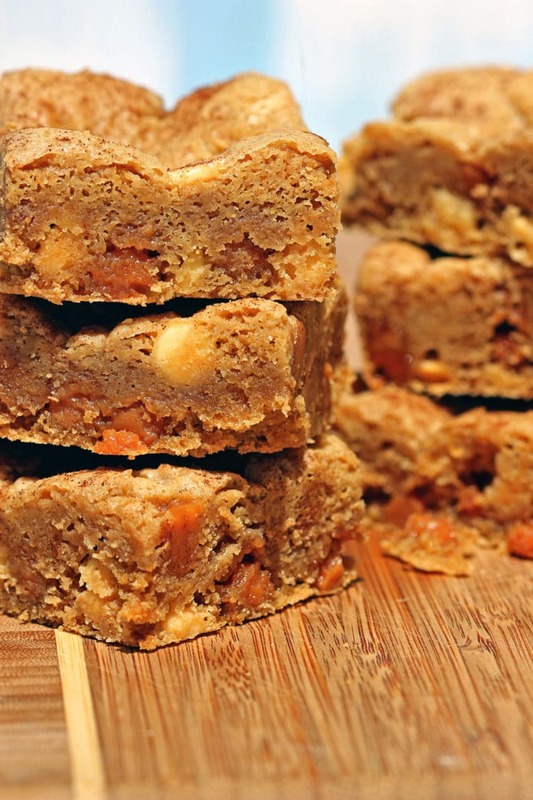 Like blondies and brownies. Well you get my point, I love desserts like these that are hand held. Not that they last long, but no plate and fork required here. 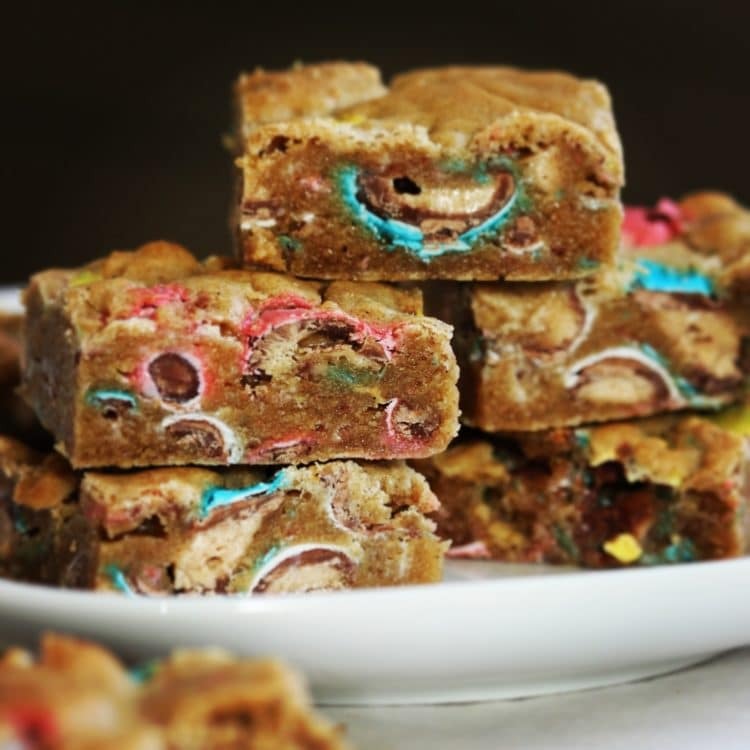 If you like blondies try my Marshmallow Butterscotch Blondies, Chocolate Malt Ball Blondies or White Chocolate Caramel Blondies. 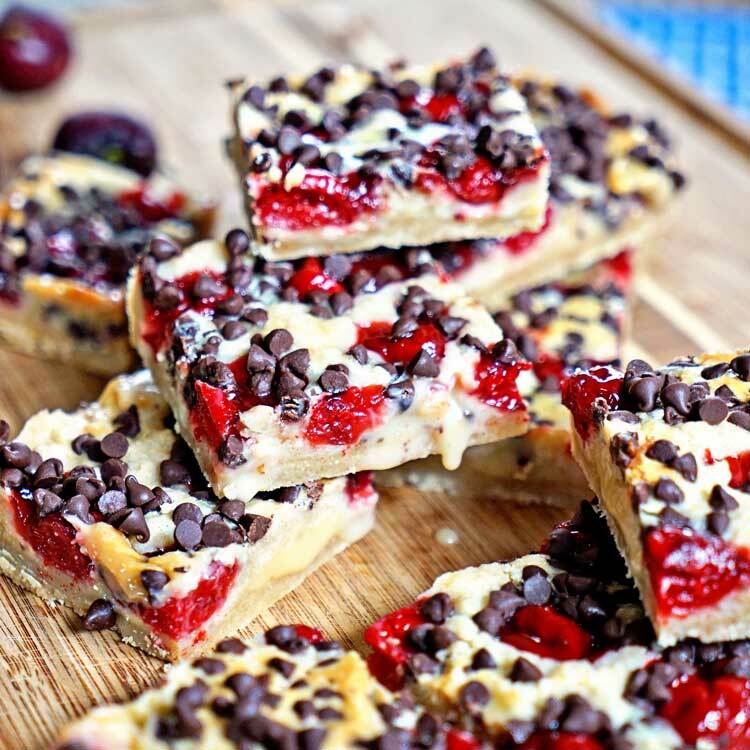 If shortbread is more your thing try my Espresso Chocolate Toffee Almond Shortbread Bars or these White Chocolate Cherry Pie Shortbread Bars. Get a big, cold glass of milk and dig into one of these. Or if you’re like me, you’ll have two because they are that good. For taste testing purposes of course. Enjoy! This recipe first appeared on Keviniscooking in July 2016. Preheat the oven to 325°F. Line a 9x13” baking dish with parchment paper. In a large bowl combine butter and sugars, mix until creamy and add the vanilla. Mix until combined. Slowly add the flour to the butter mixture on low speed until a soft dough forms. Using your hands press 1/3 of the dough into the prepared baking pan, and bake for 20 minutes or until the edges are a pale golden brown. Sprinkle chocolate chips on top of partially baked crust. Pour caramel sauce over chocolate chips, then sea salt flakes. 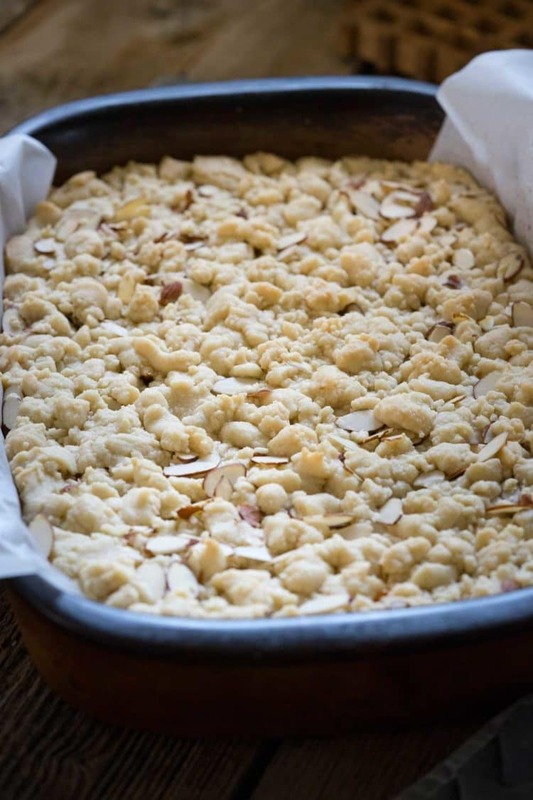 Crumble the remaining dough and slivered almonds over top. Continue baking until the topping is firm and lightly golden, about 25-30 minutes. Let cool before cutting into 24 bars. 1. 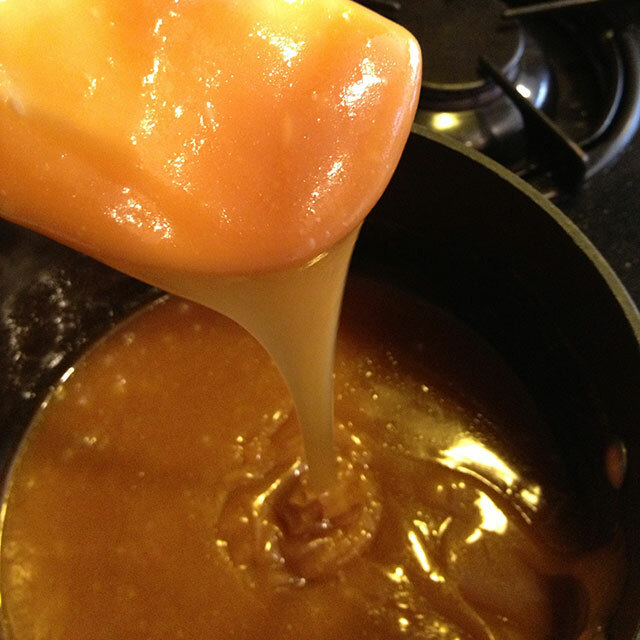 Substitute 8 ounces of caramel candies or 1 cup caramel chips for caramel sauce if needed. Sprinkle some sea salt flakes on top of caramel before adding crumb topping. Yikes! I would not be able to resist these Kevin. That crumb topping?! OMG! They look amazing! Love the video too! 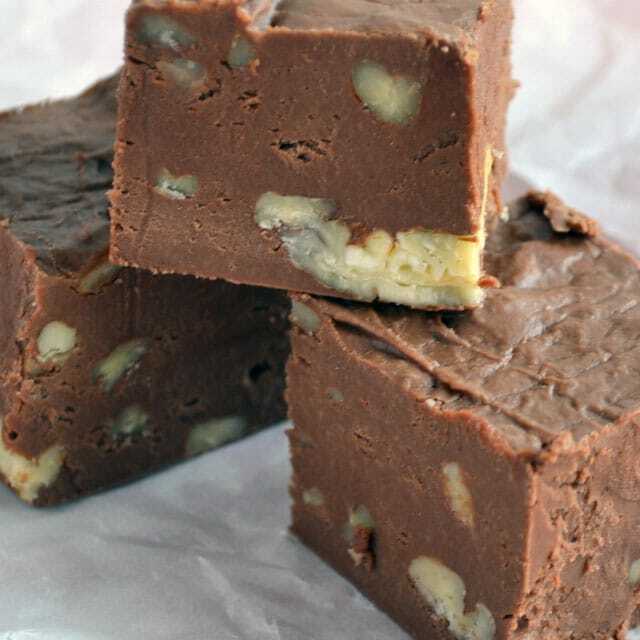 My favourite ingredients in one recipe! Amazing! I am preparing them tomorrow! So how did they turn out for you? This is a great one! Thanks for giving them a try Agness. A+ for your video, Kevin! Woo hoo for you! These look amazing (as usual). But just one thing? Why would you tempt me so much with these bites of deliciousness in January when I’m trying to be (a little) good??? Just kidding 😀 It is Friday after all and everyone knows that calories don’t count on the weekend. Right? Right 😉 Just the name alone is drool worthy, not to mention when you picked up that bar in the video and it was all caramelly. YUMMMMMMM! Pinning! Have a good one, my friend! Oh thanks so much Dawn. It is the first of many to come! YAAAASSSS! 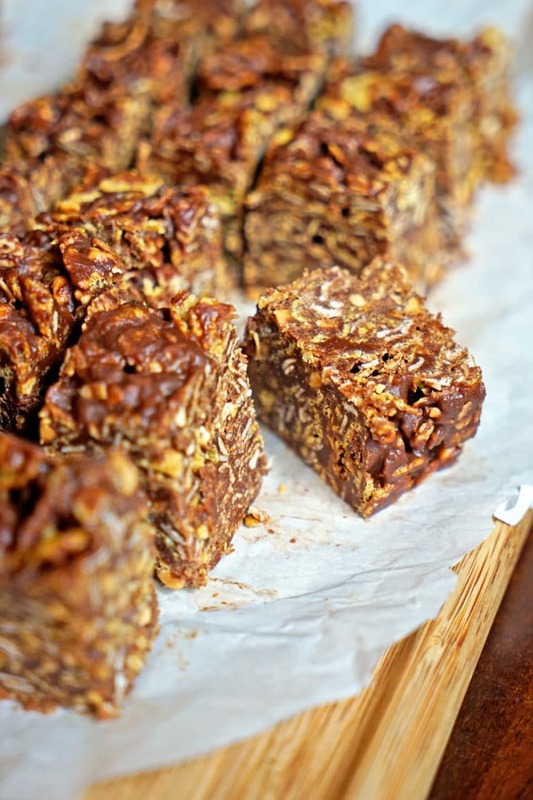 What a great adaptation of plain caramel bars! After seeing this, who will make regular ones again? Not this chocolate-lover! Pinned! Where do you put the almonds? Hi Kim, go ahead and sprinkle the almonds on top with the remaining dough prior to final baking. Sorry for any confusion.